A common fairy-tale is prices in Poland are more than in the USA. I love to hear Polish people repeat this myth. They come back complaining hour expensive things are in Poland compared to the USA or Europe. I just got back from a trip to the USA. I was visiting my folks in Florida . Again, I was comparing prices and costs in Poland to those in the USA to Poland and I found that in Poland for everything except computers for example then prices were about 1/3 cheaper in Poland. If a T-shirt cost 8 dollars in Florida in Walmart, then same thing would be 8 zołty in Poland in Auchan. If a pound of potatoes is 3 dollars in the USA than it is is 3 Polish żłoty a lbs (not kg) in Poland or cheaper. It is that simple. How do you convert American costs to Polish prices for food? Since a kg is 2.2 lbs and dollars to the Polish currency is about 2.8 to 1. Then you can convert the price per pound in the USA to the price in kg in Poland in złoty. To do this times it by six. Therefore, if the price for apples in the USA is 3 dollars a pound it is 18 złoty a pound. I think this is one of the reason many Polish people get confused, they do not convert it properly. Actual prices of the most important monthly cash flow expenditures are about 300% more in the USA. That is the price of food, clothes and housing is cheaper in Poland by 1/3. This is what matters in economics, what you spend your monthly cash flow , not some exceptional item. The question is why? The answer is simple. Labor costs and supply and demand. For every item on the shelf built into the price there is a cost of labor. Take an apple for example, every cashier, every truck driver who transported the items or manager who mangers the place or the accountant who looks at the books gets paid in the local currency. If the product is local such as an apple then the farmer gets paid in Polish złoty, not dollars. Further, if prices were high than people would not demand the product based on the laws of supply and demand. The prices are connected to the people’s ability in Warsaw or Krakow or Gdansk to pay for it. That is the monthly salaries. What about housing? 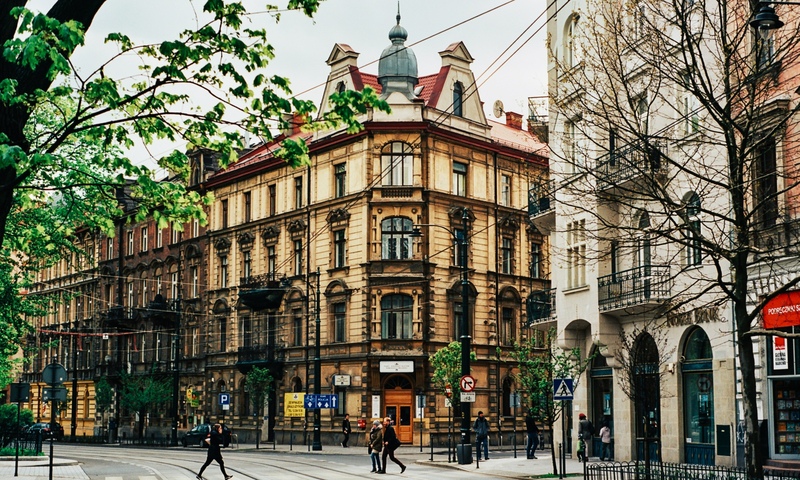 The people who build houses get paid in Polish złoty. For the accountants who do the books or the lawyers who draw the contract. The people who maintain the building get paid 6 pln an hour or about 2.5 dollars an hour. The people who make the brick do not get paid in American wages but Polish wages. They are paid in local currency. Therefore, the prices are about 1/3 cheaper as people do not make as much in Poland. Do not believe the Polish fairy-tale that America is cheaper. Use objectivity and analysis to see the issue clearly. Polish prices -What currency do you get paid in? If you make dollars in Poland you are rich. Poland is a recipient of globalization and jobs. America and the UK is a net loser and export jobs to low cost countries. The better place to live in terms of cost is Poland. If you make złoty than your income is about the same as if you live in the USA. Perhaps in the USA your buying power is about 20 percent more as you are paid in dollars and some items like computers are not affected much by local conditions (but how often do you buy computers? its not something in your monthly budget). If you average all good, commodities like food and clothing selling about 1/3 cheaper and universal goods like computers (which are not part of your monthly purchases by the way) then lets say it is 1/2 price in Poland to be generous. Polish people can go to the west, make US dollars or GBP, save money and come back to Poland and take advantage of this currency difference and buy a house in cash. No Brit could do the opposite. Polish people intuitively know things are cheaper in Poland that is why they save money in foreign countries and buy a house in Poland. Polish people will point to exceptions, for example people will talk about some American designer jeans and say its a little more expensive in Poland. My reply is, Polish companies make beautiful designer clothes. If you want to be Paris Hilton and wear things for their name, that is what everyone else has, rather than for the beauty than yes you might pay a little more in Poland. What about VAT? America has VAT, its called sales tax, usually about 6% to 10%. Its not 22% but this needs to be calculated into the final analysis. Polish people ignore this when they calculate the price. Polish people repeat a common myth that things are more expensive in Poland. I live in both countries and have studied economics. I look at it objectively. Not just some exceptional item. In fact, I have even put it on a spreadsheet before. The reality is if you live in Poland you are living in a low cost country. The laws of supply and demand are universal and apply. If you go to Switzerland then things cost more than Mississippi. If you go to New York than things cost more than Alabama. Yield to the logic of the the situation. If you go got Poland things are much cheaper than the US. It is a great place to go shopping or live. Why pay 300% for the same item in the USA? Prices are cheaper in Poland. What are the prices of cellphones in Poland? For example a blackberry or an iphone? These items are about 20% higher than in the USA, but if you buy them off of allegro.pl they will be cheaper than the States. I think Poles are very good in the market and finding bargins. It also depends on the dollar. If the dollar continues to tank ten they will be cheaper in Poland. But these are US items not strickly Chinese so it is generally cheaper in the USA regardless of currency price swings. bmwusa.com/Standard/Content/Vehicles/2011/5/528iSedan/default.aspx< nowe.mojeauto.pl/dealer/Lodz/BMW/tlokinski/oferta/bmw_seria_5_528i,354616.html nowe.mojeauto.pl/dealer/Lodz/BMW/tlokinski/oferta/bmw_seria_5_528i,354616.html price in USA is around 45k USD compared to around 70k USD in Poland. If you are talking luxary cars yes. But if you go to Germany and buy it direct, I am skeptical, it would not make sense that you can buy something cheaper in the states then a German car, made in Germany direct. I can buy a brand new Fiat for 7,000 usd and this is for European roads. In the States a new car is more. But your right on high end cars, it is better to bring it in. The prices in Poland are much higher than USA, there are an exception that is the food. If you are earning 500USD in Poland and 2000USD in USA for the same job, where is higher the level of life? Food is cheaper and better quality in Poland. This is your highest variable cost. Flats are cheaper in Poland also this is your highest fixed cost. How often do you buy a laptop or phone? Clothes it depends and can be argued either way, and petrol, if more in Poland, but since trams and buses are everywhere, I do not need a car, in the USA you need a car. But for basic living food, clothes and renting a place, it is cheaper in Poland as well as Medical care. For buying computers it is the same price or slightly more. What would be the price of glasses frames from an optician with new lens in them? Cheaper than the West by a large amount because my friends order than Online. I would say the whole thing maybe $50 dollars if you get a nice pair.